My top 10 list is on the Regent Seven Seas Voyager. I selected it to illustrate what it's like to be aboard a luxury cruise ship because of its reputation among seasoned travelers. All the cabins on the Regent Seven Seas Voyager are suites. Each has a separate seating area plus a balcony with an unobstructed view. The Regent Seven Seas Voyager is a mid-sized cruise ship yet carries a maximum of only 700 passengers (similar-sized liners usually carry twice that number). It never feels full, even when everyone is aboard. The service staff on this luxury cruise ship is professional, gracious and attentive. You are treated as an individual, not a number. Overall, there are 447 crew members for 700 passengers. 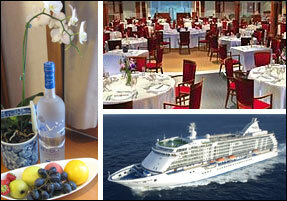 The Regent Seven Seas Voyager ambiance is luxurious, tasteful and refined. The travel lifestyle is relaxed and unpretentious. The food quality and presentation aboard the Regent Seven Seas Voyager are among the best on the high seas. And you can dine in four different restaurants.